Industrial Innovations' Spra-Rite Roll Coating system features a solid roll in sizes from 12-in. to 80., enabling the roller to be changed within minutes while the external roller lubricant application feature helps to ease maintenance. The Roll Coaters are designed to provide precise and uniform lubricant coverage on parts prior to the stamping operation, helping to improve quality and minimize waste. Roll coaters provide an environmentally friendly approach to lubricant application by transferring lubricant from the surface of the roller directly to the surface of a part. The systems feature programmable independent fluid control for adjusting the thickness of the lubricant transferred to the part. Whereas most roll coaters are comprised of 6-in. to 12-in. rollers, which are connected to achieve the final roll size, the Spra-Rite systems feature a solid, one-piece, quick release roller. This can reduce changeover time from over an hour to minutes. 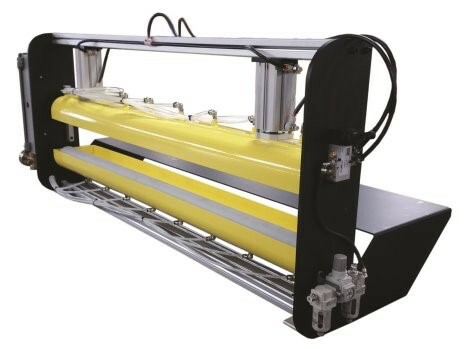 Additionally, these roll coaters offer simple coil feed installation with coil or power feed capability, automatic press control communication and 200-part recipe capability. These roll coaters and also accommodate Spra-Rite manifolds, an added benefit for existing Industrial Innovations’ customers.